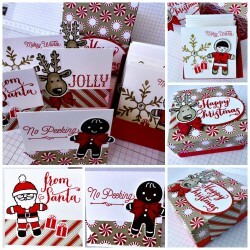 Just Julie B's Stampin' Space: Christmas Cookie Cutter Tags & Matching Gift Box! Your holiday presents will stand out from the crowd with these charming tags! You’ll have fun creating this set of 12 (three each of four different designs) gift tags and the matching lidded box. The set is created in traditional colors for easy co-ordination and the tags are a generous 3” x 3” size for adding your personal message. Use the tags and box separately for your gifts or give the entire set to a special friend! This super sweet project was made by Pat Tecza and you can get her tutorial when you subscribe to the month of November over at Craft Project Central.